Would you buy a used pension from this man? We just recently purchased new vehicles for my wife and daughter. We went to a total of five dealerships for those two cars. We found that two of the dealers were fair, in the sense that they did not try to hold us upside down by the ankles and shake money from our pockets like the others did. Salesman: Wasn't Adolph Hitler a terrible person? Salesman: Weren't those 9/11 terrorist attacks awful? Salesman: Wouldn't you like me to put you in this new car TODAY?? As awful as some of our experiences were, we ended up with two good deals, meaning they agreed to give us a car for a reasonable price and we agreed to pay them approximately forever. Imagine now, if you will, the worst car dealer ever. He gets you to agree to purchase a very expensive car by offering you a great trade in. He takes the old car, but never delivers the new car. And he goes to court to make sure he never has to give your promised vehicle, and that you have to make the payments even though you got nothing. Meet car dealer extraordinaire: Chris Christie. Except it isn't phantom cars he's pedaling--it's phantom pensions. Four years ago, Chris Christie decided that he could no longer fund the state pension system, because he needed to give the taxpayers' money to the rich to buy diamond encrusted saddles for their polo ponies, and for taxpayer funded helicopter rides to his son's baseball games. So what happened was exactly what would happen to you if you stopped paying for your car. They repossessed New Jersey. Just kidding, of course. Only the common people get things taken from them when they don't meet their obligations. 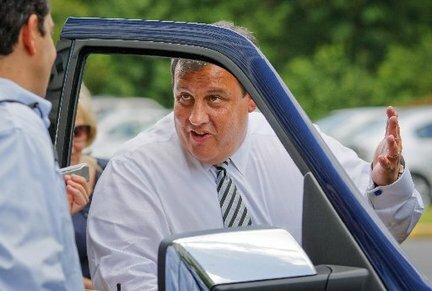 What really happened was that Christie reached a deal with NJ's public employee unions, in which he agreed to make those payments if the unions agreed to pay more into the pension fund themselves. For four years, the unions have dutifully paid their agreed portion, but Christie decided he did not have to actually do what he agreed to do. He stopped making payments. So this time around, they really did repossess New Jersey. Just kidding again. What really happened was that Christie was taken to court and ordered to make the payments on the law he signed. End of story, right? Well, no. He went to the NJ Supreme Court, which decided in its infinitesimal wisdom that it could not force Christie to make the 1.57 billion dollar payment he promised to make. Instead, the court said the governor and legislature--the ones who wrote the law in the first place--should figure it all out and fix the problem. This is akin to the car dealer mentioned above. He takes what you had, gives you nothing new, and forces you to make payments for years. When it gets to court, the judge decides that the salesman and his manager should go back and figure out what to do about it. In the mean time, public employees are keeping up their end, because they can not just stop paying in the money they agreed to like they're the governor or something. This should be a cautionary tale for all public employee members. Never, EVER, agree to pay into the pension fund, because if you do, there is already a judicial precedent that the state does not have to hold up their end, but you do. Cuomo: Aren't pensions a wonderful thing? Cuomo: Aren't you glad you can retire at 57? Cuomo: Wouldn't you like to contribute a portion of your salary to make sure things stay that way? Our answer should be a resounding NO. Even if he throws in free rustproofing. Best deal I got for the last car I bought was via Costco. Also, they're union friendly. I'm not a Costco member, so I used TrueCar, which is basically the same thing. The two dealers I bought from honored that price without trying to add on charges. The other three swindlers tried to steal my incentive, switch the price at the last moment, and pump up the interest rate. The car we got for my daughter was about 4K under invoice, so it was an outstanding deal. The bad part about Truecar is that dealers get your phone and email and stalk you. But that's over now, and I feel I did well. If only our union understood things like walking away from a bad deal. I think nothing is more repulsive than shady dealers and their tricks. If the purchase is major, it is especially important to use the help of a fair salesman. I am glad your experience ended up well. It is important not to lose a great deal. Luckily, if you need a certain amount of money fast, you may find it here and profit from any limited time offers. As for the pensions, your story about Chris Christie really got me thinking. Thank you for an interesting article and valuable information.